Sign in here to download a complete chapter from Selina's book. Read and learn why your developed vision is what clients are looking for. 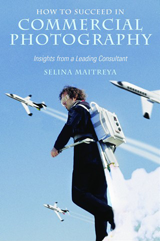 That "leading consultant" is, of course, Selina Maitreya. Her latest offering has risen to Best Seller status and has been internationally acclaimed. Via essay form, Selina delivers gems on six critical topics: Vision. Value. Team. Tools. Persistence. Faith. These areas are exactly where photographers have to put their energies and emphasis. This is not speculation, this is fact proven over and over by Selina and the other experts within theses fast-reading pages. Start at page one and read to The End, or go totally random. This volume is designed to accommodate even the most attention-challenged, non-linear creative mind. Infuse your business and work with the practical and spiritual lessons contained within this book and within Selina. Your entire business is right here. Download "The Hard Workin' Worksheet" PDF companion to the book. "This is one of the best advice and consulting books I ever read and owned in regards to be successful in this highly competitive industry. Selina is very generous in dispensing her knowledge and experience in helping photographers to succeed." "There are lots of exercises and resources that one can explore deeper in this ever changing industry. Yes, reading this book will not guarantee you fame and fortune, but it opens the window to possibilities. The rest is up to you to make it happen"